With incredible attention to detail, the sleep engineers at Sherwood Bedding Group have combined the best fabrics and earth-friendly materials with advanced pocketed spring coil designs to craft these extraordinary mattresses. You simply can’t find a better mattress! True luxury has a timeless quality that transcends fleeting fashions. All Lumina® mattresses are crafted around our pocketed spring support system. Each coil spring is individually encased in its own lightweight, durable fabric pocket. This design allows each coil to respond independently, improving support and eliminate motion transfer. 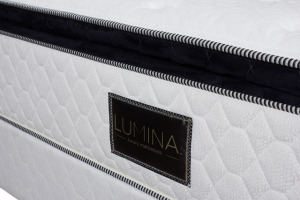 Lumina® mattresses are available with an array of the finest comfort materials in the top layers to relieve pressure and improve back support. By utilizing only the best foams and fibers, you are virtually assured of deep, luxurious sleep year after year. You’ll wake refreshed and wondering why you didn’t buy a Lumina mattress sooner.